A portion of the proceeds from the sale of these prints will be donated to the SPCA. 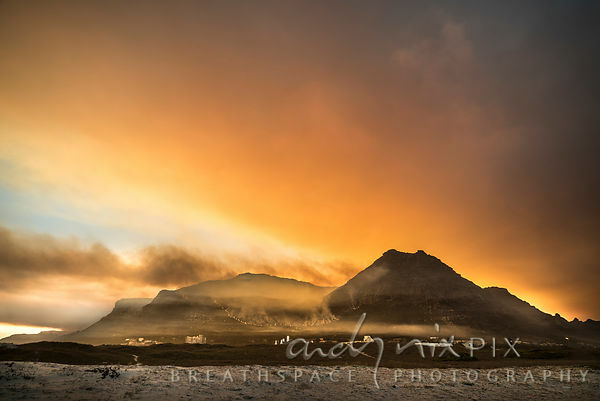 After burning all the way across the top of Silvermine from Muizenberg to Hout Bay, the fire came full circle on the lower slopes early this morning to its starting point at Farmer Pecks. I stopped in at the Lakeside fire station, where an exhausted yet upbeat crew related how they had been operating the only urban area fire engine, responding to a number of fires during the night (including one in Kuils River where they had to deal with rocks being thrown at them! The mind boggles!) The rest of the city's fire crews were stationed at various files around the mountain. Ou Kaapse Weg was open again and I drove up to view what the fire had left in its wake. The air was at least five degrees warmer on the mountain, and burned signposts were still smouldering, as were a number of holes in the ground where pine stumps had been (emitting an admittedly fragrant scent). Across the valley smoke continued to billow from the pine plantation above the Tokai Arboretum, where fire crews were stationed all night trying to contain the fire, yet slowly being forced to concede ground to the fire. Shortly after sunrise the helicopters arrived to start water bombing again. 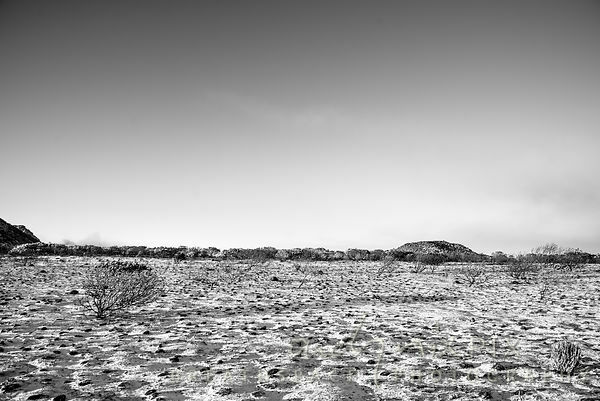 I spent some time looking around for signs of life, and found a few tracks of bokkies, lizards and small insects. To my surprise I could hear quite a few species of birds, and I watched a pair flitting around a bush, calling to each other. Numerous ants scurried about, but apart from them and a lone beetle, I found nothing else. 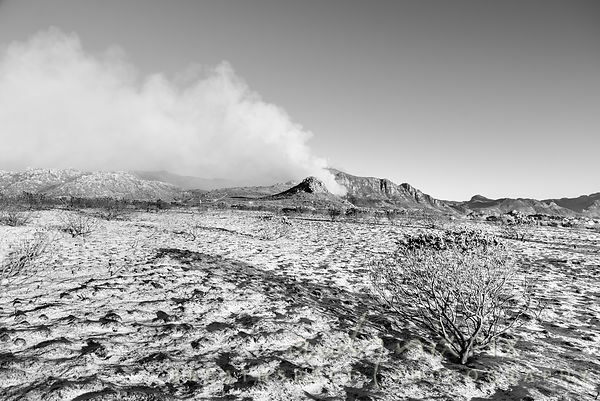 Given the vast extent of the fire, I can only wonder where the wildlife would escape to, and the difficulties any survivors will face while the fynbos regenerates. The SPCA has requested that people nearby place shallow dishes of water in their gardens, along with seed and fruit for any refugees that make it. I know a number of vet clinics are clearing their schedules to treat any injured wildlife found in the aftermath. (Incidentally, today happens to be World Wildlife Day. Tragic and devastating as the effects of this fire are, it's good to remember how the mountain fauna and flora survived after the hectic fires of 2000, and hope that it will flourish again, soon. 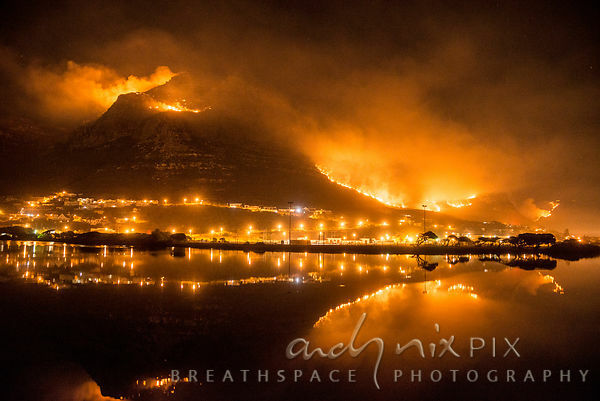 Silvermine West, with Constantiaberg and the upper slopes of Tokai Forest still burning. 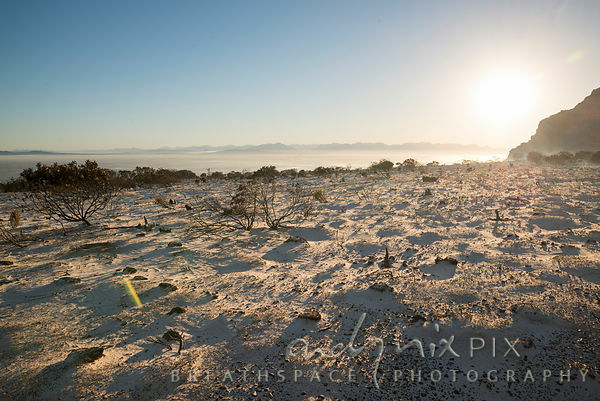 Silvermine East, with smoke covering the Cape Flats vally at sunrise..